One of my favorite things in the universe is the chocolate orange bread from Essential Baking Company in Seattle. 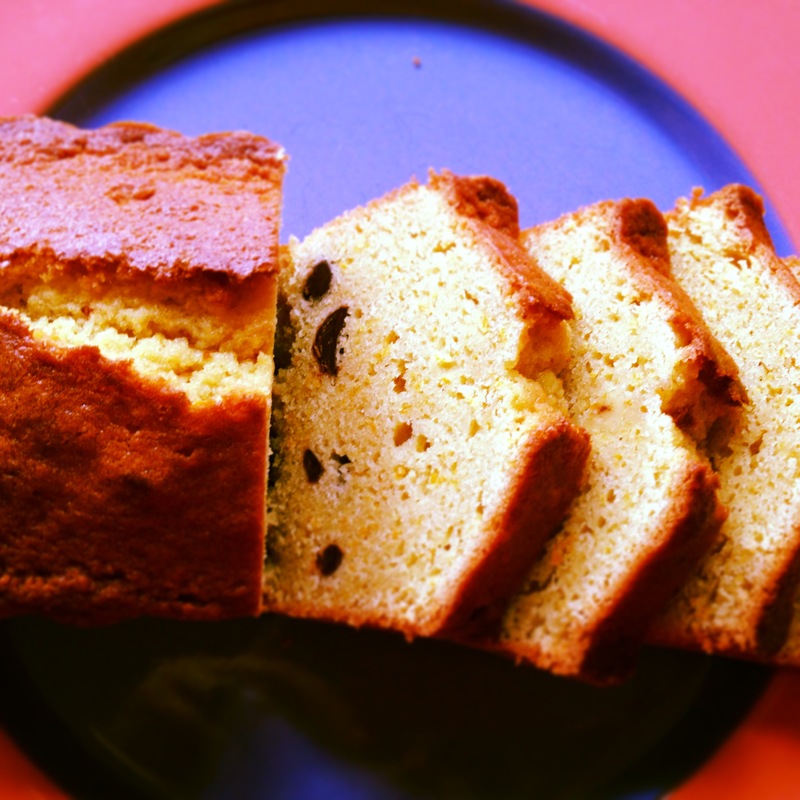 There are sooo many other great pastries to choose from, but I have never been able to say no to their chocolate orange bread. I have always wanted to try to replicate the bread at home, and I think I have found a great match! Ina Garten, of course. 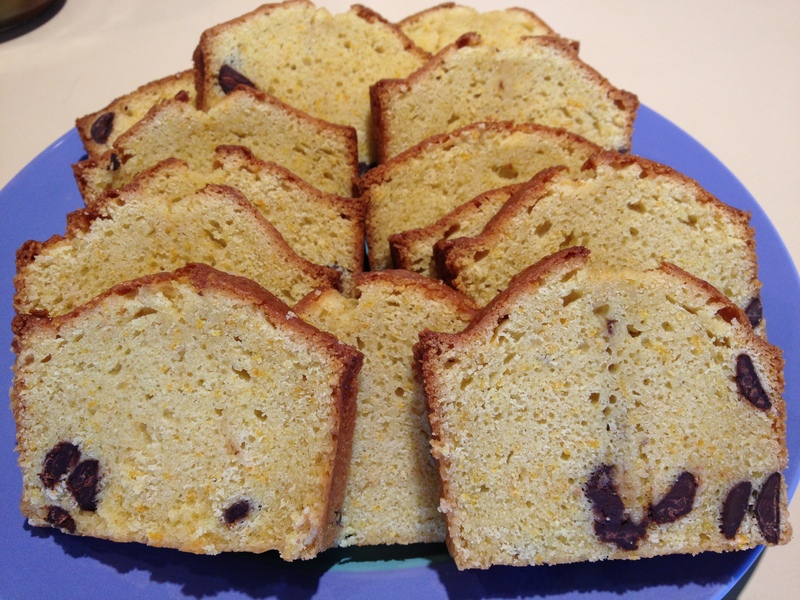 Her recipe for Orange Pound Cake is simple and amazing, and I added some dark chocolate chips and things came out beautifully. There was, however, a moment when I thought it wasn’t going to cook through in the center. Those last 10 minutes really change everything and suddenly the bread was done. There is an option to add an orange glaze, however I opted out because I had already added the chocolate. Either way you go, this is an amazing way to enjoy a lovely, cakey orange flavor! From Barefoot Contessa Family Style (with an addition of chocolate)! 1. Preheat the oven to 350°F (175°C). Grease two 8 1/2 X 4 1/2 X 2 1/2 inch loaf pans. Line the bottoms with parchment paper (I didn’t do the parchment paper and the loaves still came out great). 2. Cream the butter and 2 cups sugar in the bowl of an electric mixer fitted with the paddle attachment for about 5 minutes, or until light and fluffy. With the mixer on medium speed, add the eggs, one at a time, then the orange zest. 3. Sift together 3 cups flour, the baking powder, baking soda, and salt in a large bowl. In another bowl, combine 1/4 cup of the orange juice, buttermilk, and vanilla. Add the flour and buttermilk mixtures alternately in thirds to the creamed butter, beginning and ending with the flour. Toss the chocolate chunks with 2 tablespoons flour and add to the batter. Divide the batter evenly between the pans, smooth the tops, and bake for 45 minutes to 1 hour, until a cake tester comes out clean. Let the cakes cool in the pan on a wire rack for 10 minutes. 4. OPTIONAL: While the cakes bake, cook the remaining 1/2 cup of granulated sugar with the remaining 1/2 cup orange juice in a small saucepan over low heat until the sugar dissolves. When the cakes are done, let them cool for 10 minutes. Take them out of the pans and place them on a baking rack set over a tray. 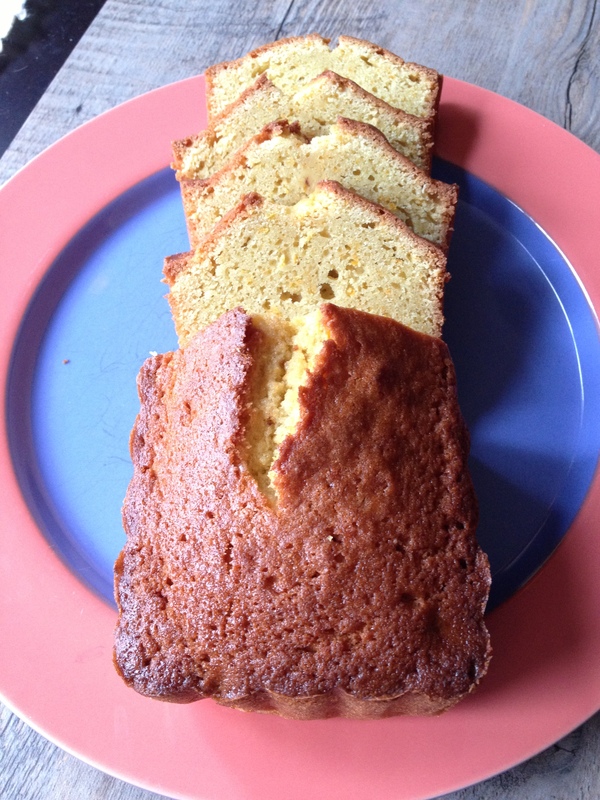 Spoon the orange syrup over the cakes and allow the cakes to cool completely. 5. OPTIONAL GLAZE FOR ONE LOAF: To glaze, combine the confectioners’ sugar and orange juice in a bowl, mixing with a wire whisk until smooth. Add a few more drops of juice, if necessary, to make it pour easily. Pour over the top of one cake and allow the glaze to dry. Wrap well, and store in the refrigerator.